Walt Disney spent the majority of his life focused on progress-- from the first full length animated feature ever made to technology that amazed even the forefront of science within his own park of Disneyland. Walt was so adamant about progress that it should be no surprise Walt Disney World is constantly changing, updating, and switching out old rides to install new ones. It was Walt who said: "We keep moving forward, opening new doors, and doing new things, because we're curious and curiosity keeps leading us down new paths." At Walt Disney World, Imagineers are constantly attempting to move forward, bringing new and compelling content into the parks to delight guests everywhere. When you think of the Magic Kingdom, you might think of Cinderella's Castle, Main Street, U.S.A., or princesses making dreams come true. In terms of thrills within the park, there may be nothing better than a high speed journey through space on Space Mountain-- but Tomorrowland once was home to a much darker, much more terrifying attraction. As you may have noticed in the picture above, the ExtraTERRORestrial Alien Encounter attraction was touted as a "sensory thriller" from the minds of both Disney and George Lucas. Then Disney CEO Michael Eisner praised the idea of the attraction, wanting to give teenagers and adults a different kind of experience within the Magic Kingdom. 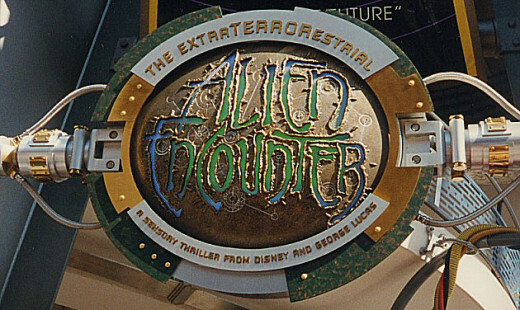 In December of 1994, the doors to Alien Encounter were opened for the first time, letting in not only young adults but curious children of all ages... after all, this was the Magic Kingdom, and it couldn't be too scary, right? Wrong. After walking through a pre show featuring a cute and fuzzy alien, guests were funneled into the room where all of their nightmares were about to come true. 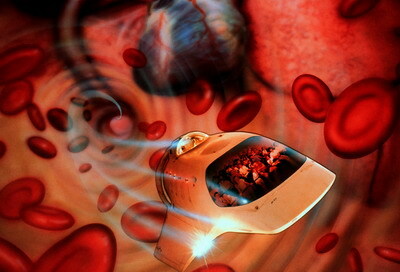 Sitting in a circular room (picture above right) with a safety harness descending over your shoulders to lock you in, you were treated to a few short moments of setting up the story: a man would soon be teleported into the glass tube in front of you to demonstrate some new scientific technology. Unfortunately, something got mixed up in the teleportation process and you were face to face with a giant and vicious looking creature. Moments later, the theatre was plunged into darkness, glass could be heard breaking, and it was clear what had happened: you were stuck... in the dark... with the creature that was now completely free. Hot breath could be felt on your neck. Sounds of a guest getting torn apart could be heard, and the pressure of the alien's weight climbing throughout the room could be felt on your shoulders. In 2003, Disney decided that the alien had done enough terrorizing and replaced the Alien Encounter with the much more family friendly Stitch's Great Escape, using characters from the popular Disney film Lilo and Stitch. 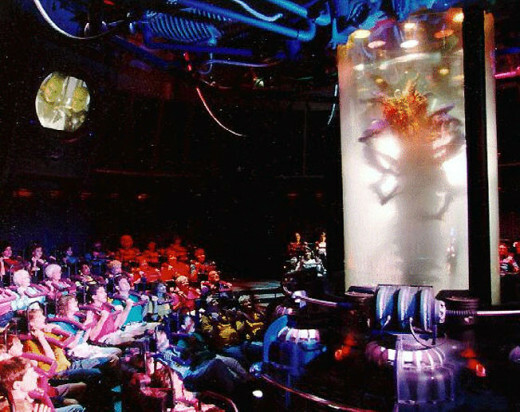 While the same room and some of the similar effects from Alien Encounter are still used to this day at Stitch's Great Escape, there's no doubt that the fear factor was dialed down-- way down. 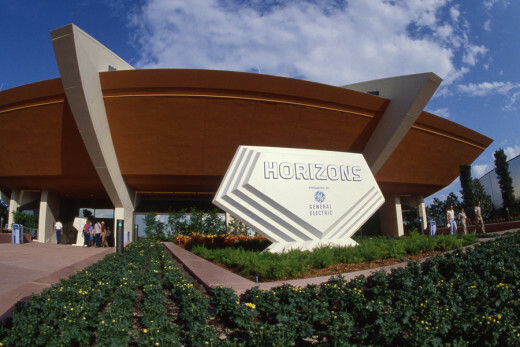 Horizons opened in 1983 at EPCOT Center, providing a glimpse of the future to anyone willing to step through the doors. When the attraction was built, Imagineers considered it to be a "sequel" of sorts to Walt's original creation the Carousel of Progress, still seen in Magic Kingdom to this day. 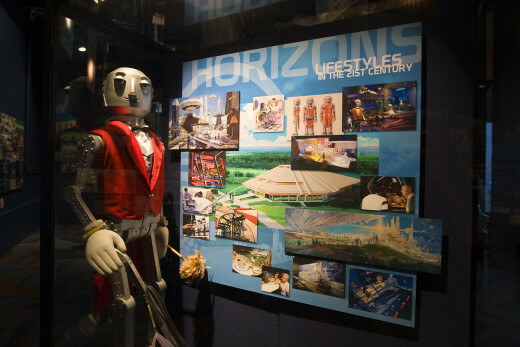 Horizons allowed guests to not only view current technology that could build the world of tomorrow but also used imagination to paint a picture of what the future may hold. By visiting floating cities in the Pacific Ocean, a desert complex, and even a space station, guests could dream about where humans might live in the 21st century. Most remarkably to some guests was the strong smell of juicy citrus when moving past an orange grove within the ride. For these reasons and many others, Horizons found its way into the hearts of many guests-- and some didn't want to let the attraction go. 1) There was no security system or cameras of any kind on the ride. 2) They were going to sneak through the ride every single day until it closed. Day after day, Hoot and Chief climbed out of their ride vehicle and explored every single inch of Horizons-- taking pictures, looking at ride props from new angles, and even climbing up into ceilings. If you're interested in seeing some of the pictures they took or hearing a few of their crazy adventures (and how they avoided security while doing it), check out Mesa Verde Times. The Backlot Tour opened on the same day as Disney-MGM Studios (now known as Hollywood Studios) on May 1, 1989. Although you may have taken a ride on the Backlot Tour, you may not have been able to experience it in it's glory days when the park first opened, back when the tour made the Studios seem like a real working movie studio each and every day. The original tour was a whopping two hours long, partly a walking tour and partly a tram ride through the sights of Hollywood. Taking the tram provided guests with a trip down Residential Street, a row of famous houses recognizable from movies and television productions such as Earnest Saves Christmas and the Golden Girls. Other tram stops included Catastrophe Canyon, a "movie set" that put you in the heart of a disaster movie. In the second half of the tour, guests would walk through behind the scenes areas such as the Production Center (catching a glimpse of costumes being created for the Hollywood stars) and The Scenic Shop (where craftsmen would work creating and building the sets that would soon host famous movies). Park visitors could even take a ride on the bumblebee from Honey, I Shrunk the Kids in front of a green screen, creating their own magical Hollywood moment. As the years progressed, the Backlot Tour became shorter and shorter. Initially, Disney realized the two hour trip was too long for some guests and decided to separate the tram and walking portions of the attraction into two separate attractions entirely. After a few years of this setup, the walking portion of the tour shut down forever. Eventually one big problem became evident: no new Hollywood productions were coming to film at Disney-MGM Studios, opting instead for sound stages in California. 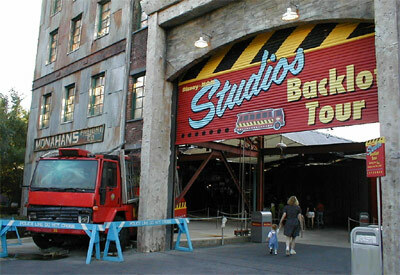 While once a real view into a thriving moviemaking process, the Backlot Tour became no more than a tribute to the past. When Residential Street was demolished in 2003 to make room for the car stunt show known as Lights, Motors, Action!, it seemed the final nail went into the coffin. 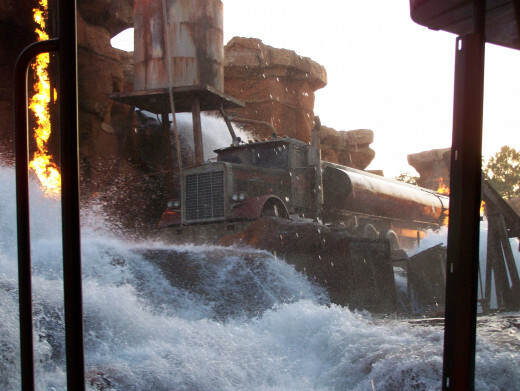 Becoming nothing much more than a tram ride into Catastrophe Canyon, the Studio Backlot Tour became less and less popular-- finally closing for good on September 27, 2014. 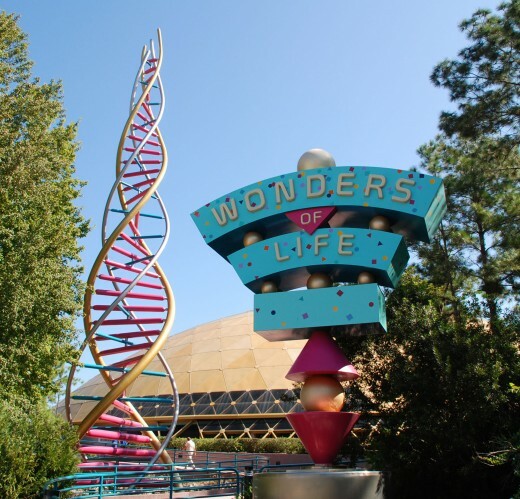 Located at EPCOT, the Wonders of Life pavilion wasn't so much of an attraction as it was a collection of attractions, rides, and compelling movies that focused on one thing: the amazing gift of life. Through comical and interesting films, Disney taught park guests of all ages about healthy choices and the wonders of life. For example, Goofy About Health used classic cartoons featuring the popular character to praise the benefits of balancing proper exercise, rest, and meals into a healthier life. The Making of Me was a film featuring popular actor Martin Short, addressing the question of "where do babies come from" in an honest way that was appropriate for all ages. 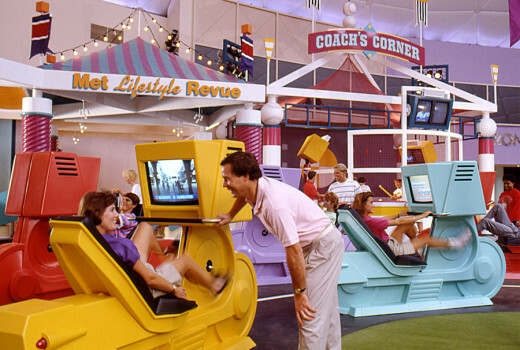 The most popular parts of the Wonders of Life pavilion were more interactive: Body Wars and Cranium Command. Body Wars was actually EPCOT's first thrill ride, using a motion simulator (similar to Star Tours) that took guests through the bloodstream in a human body. Cranium Command was a full blown show centered around the human brain, giving visitors a look inside the brain of a twelve year old boy and the "pilot" named Buzzy who had been put in charge of making sure everything inside the boy's brain moved smoothly. By using humor, Audio-Animatronics, and an all star cast of celebrities to play various characters, Cranium Command subtly taught park visitors about the importance of the brain. As the years continued on, the look of the pavilion became a bit outdated (check out the picture to the right for an example-- very 1980s) and companies that once sponsored the Wonders of Life decided to not renew their sponsorship. 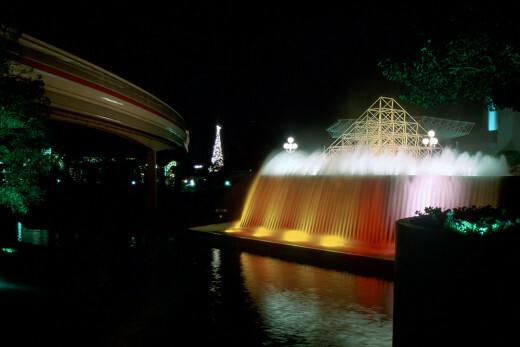 Instead of attempting to revamp the entire pavilion, Disney decided that money would be better spent elsewhere-- opening nearby Test Track, redesigning the Universe of Energy with comedian Ellen DeGeneres, and designing other thrills throughout the park to replace Body Wars. In 2007, the Wonders of Life pavilion closed it's doors, but guests are still allowed inside the general area during special events such as the annual Food and Wine Festival (no former attractions are available, only the general space is used). 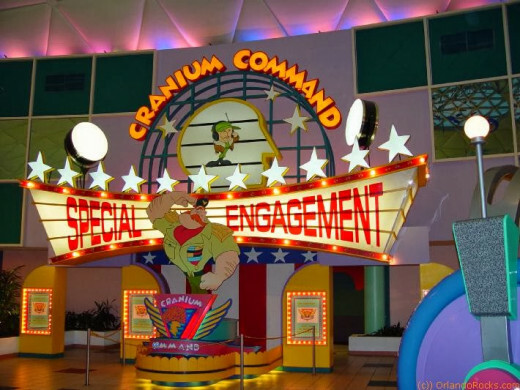 Additionally, reports from as recent as 2013 say that Cranium Command still exists (Buzzy, brain set and all), gathering dust behind the closed doors. Walt Disney personally worked on the original Enchanted Tiki Room, an attraction created for the Adventureland with a Polynesian theme. Featuring over 150 singing, moving, animatronic birds, the original attraction wowed crowds of all ages upon opening at Disneyland in 1963. The attraction was such a success in Disneyland that Imagineers decided to include it at the Magic Kingdom at Disney World, although with the slightly different name of "Tropical Serenade." By 1998, however, the Imagineers decided that something new was needed at Disney World... so they introduced the "Enchanted Tiki Room: Under New Management." 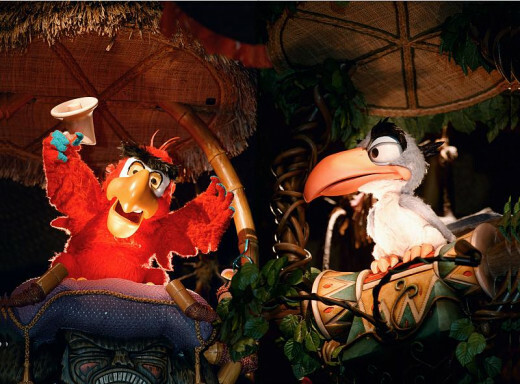 Featuring popular birds Iago from Aladdin and Zazu from The Lion King, the new Tiki Room started the way it always had: birds begin singing a familiar song, only to be rudely interrupted by Iago singing "Get a life you guys, you're 18th century!" Zazu and Iago were enormous in comparison to the much smaller original birds of the Tiki Room, and many older guests familiar with Walt's original version of the attraction were infuriated that one of his original attractions had been so visibly altered. Part of the show featured the tiki gods' anger against Iago for his insults against them-- eventually resulting in a charred and bandaged Iago as the gods burn his feathers for what he's done. Interestingly, a real fire broke out in the attraction in January of 2011, burning the Iago animatronic beyond repair. While some guessed that a new Iago figure may be put inside the show and reopened at a future time, the mountain of complaints against the new show had become so burdensome that Disney decided to make a different choice. In 2011, the doors opened once again to the original Disneyland show, renaming the entire attraction to reflect it's creator: Walt Disney's Enchanted Tiki Room. If you were given the power to bring just one of these attractions back, which would it be? My family and I will eternally miss the Alien Encounters. 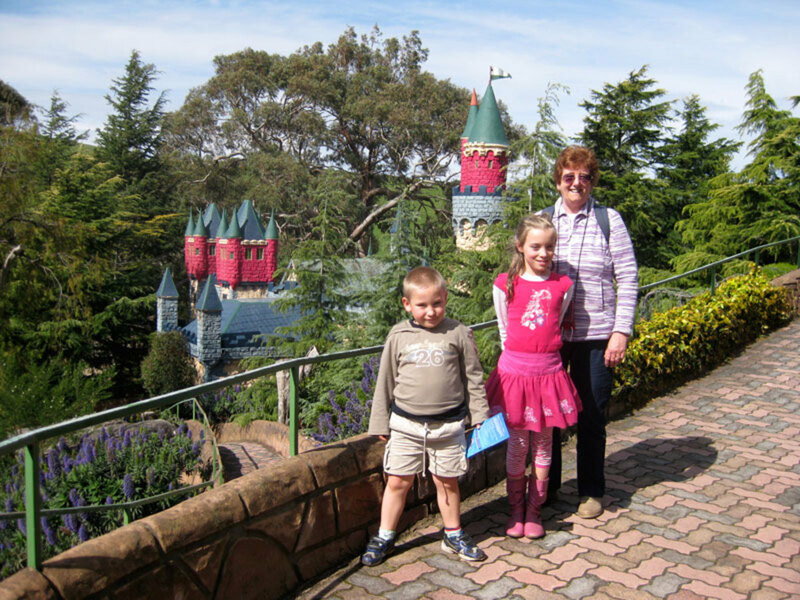 We were discussing it with our family friends even last night as we planned to visited the WDW again in 2015. We last visited it in 2002. We also miss The Enchanted Tiki Room Under New Management. This article was really interesting, and slightly sad that some of these attractions are not there anymore. I am glad I rode some of them that were still there when I first visited Disney World.